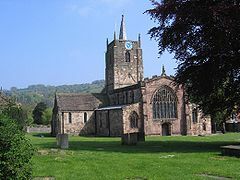 St. Mary the Virgin, Wirksworth was founded, according to some traditions, by the Saxon missionary Betti in the 600s AD. There has probably been a church on this site since the time of Edward the Confessor (1042–66). One of the most impressive remains from the original church is the Saxon coffin lid, dating from around 800. It shows scenes from the life of Christ and the Virgin Mary depicted in an almost comic strip form. There is an early medieval carving of a lead miner built into the south transept wall. This is the oldest of its kind in the world. Also in this church is a massive Norman font. The present church dates largely from the 1200s to 1400s. There were then many alterations in the 1800s. The north transept stained glass window by Morris and Burne-Jones was added in the early 1900s. Just below this is a collection of Saxon and Norman fragments built into the wall. Every year, on the Sunday after 8 September, the congregation observes the ancient custom of clypping. The worshippers join hands all the way around their building to encircle the church. The church is generally kept open and has some excellent visitor guides inside for adults and children. As the records for this church are larger than a web page table would permit, I have included them as a downloadable PDF file.